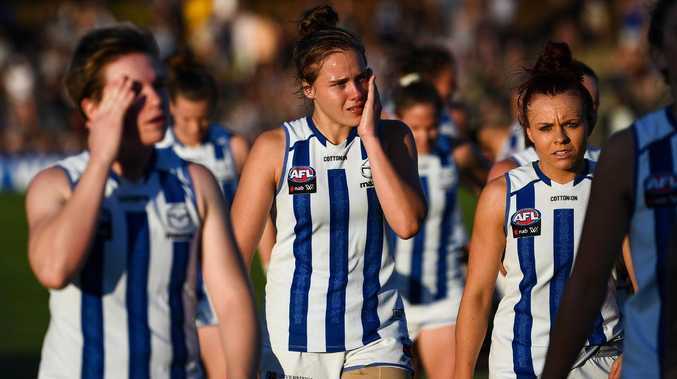 North Melbourne coach Scott Gowans has refused to criticise the AFL's lopsided conference system despite it costing his team a spot in the AFLW finals but supporters haven't been as kind. The Kangaroos were knocked out of the competition on Saturday night after being defeated by Fremantle by 27 points in Perth. It means the expansion side won't feature in the two-week finals series starting next weekend despite winning five games in their debut season. The lopsided conference system means two Conference B teams will play finals despite winning less games. Carlton, who will finish with four wins if it defeats Western Bulldogs today, Geelong (three wins) and Brisbane (must record its third win today over Collingwood to qualify) are the teams still in contention. North Melbourne also has a far superior percentage at 123.1. Melbourne has also been a victim of the conference system, finishing fourth in Conference A with four wins and a healthy percentage of 111.2. Adelaide and Fremantle have qualified for the finals from Conference A. "We knew exactly what the conference system was and what we had to do," Gowans said. "It's not like it was made up two weeks ago." 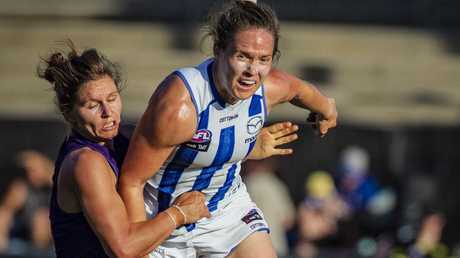 Emma Kearney’s Kangaroos were knocked out of AFLW finals contention by Fremantle. The conference system has been widely criticised this season when it became evident early in the season there was a clear imbalance as the best teams - Adelaide, Fremantle, North Melbourne, Melbourne and Western Bulldogs - were all in conference A. With four new teams - Richmond, St Kilda, West Coast and Gold Coast - to be introduced next season, the AFL could change its set up for 2020. Gowans said he'd support the model the AFL chooses. "There's a lot of challenges with making up the competition and how it's run," Gowans said. The conference system was slammed on social media following the North Melbourne result, with many venting their frustration. Melbourne coach Mick Stinear called for an "honest and robust" review of the AFLW season after his team was also knocked out despite a 4-3 win-loss record.